What are the latest developments and emerging trends in the US housing and mortgage markets? This was the overall question that was the subject of a recent conference organized by Goldman Sachs in New York City on September 11. Here is a brief summary on the conference takeaways (extracts are taken from a note prepared by Hui Shan and Marty Young, both from Goldman Sachs). India’s Housing Market: What’s happened? What’s next? What’s happened to India’s housing market? There seems to be a slowdown and also a rising stock of unsold houses. This development has led to different views on India’s housing market. In a recent interview, Raghuram Rajan (Reserve Bank of India—RBI) said that “if real estate developers, who are sitting on unsold [housing] stocks, start bringing down prices, that will be a very big help to the sector because once there is a sense that the prices have stabilized more people will be willing to buy. (…) we also don’t want to create a situation where prices stay high at the level, which means demand can’t pick up (…)”. Similarly, the National Housing Bank (NHB) and Rayman Partners also agree that house prices are high. In terms of how long it will take to clear the housing inventory, Knight Frank says that “Mumbai has the highest number of unsold units in India (…). However, the NCR [National Capital Region] market will take the maximum time to liquidate its existing unsold inventory. 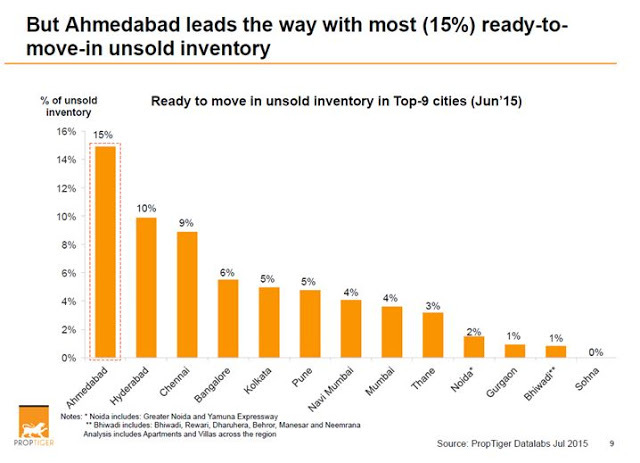 At the current pace of sales, NCR will take more than four years to exhaust the unsold homes completely. 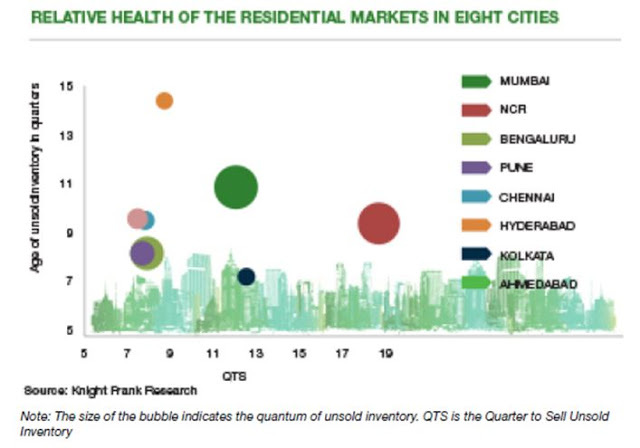 Pune is currently the healthiest market, with the lowest QTS [quarters to sell unsold inventory] and a relatively lower age of unsold inventory”. However, PropTiger and Farook Mahmood (Silverline Group and Chairman of NAR-India 7th Annual Convention) noted that when we talk about housing inventory data, we need to differentiate between the different types of inventory (e.g. ready-to-move-in vs. under-construction). More on India’s housing market. Charan Singh (Indian Institute of Management Bangalore) has studied the housing market in India. On India’s house price index, Singh notes that the NHB and RBI construct and release a house price index. But, there are a number of problems with both indices. NHB’s HPI “(…) is based on extensive data collected by different commercial banks and finance company located in 26 cities and is widely accepted in the country. Innovations that rely on data sources cannot be implemented until precise indices are provided in public domain and with robust history to inspire confidence. In India, neither data definitions are standardized nor is the methodology. The data is also collected by non-trained officials. The methodology of the RBI’s HPI is somewhat standardized but also has gaps. HPI only covers data collected from registration department of 9 cities but computes a national HPI based on that limited data set.” In a separate study, Singh compares India’s housing market with the United States and Spain and notes that there is need to have a well developed housing finance market in India. What’s happened to India’s housing market? 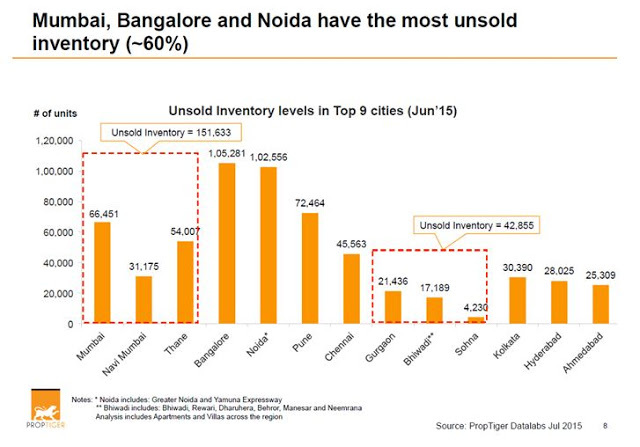 There seems to be a slowdown and also a rising stock of unsold houses. This development has led to different views on India’s housing market. In a recent interview, Raghuram Rajan (Reserve Bank of India—RBI) said that “if real estate developers, who are sitting on unsold [housing] stocks, start bringing down prices, that will be a very big help to the sector because once there is a sense that the prices have stabilized more people will be willing to buy. My presentation at the Federal Forecasters Conference summarized my work on the inability or unwillingness of forecasters to predict recessions. I also suggested that to get forecasters to predict recessions (even inaccurately) we should have a Stekler Award for Courage in Forecasting. The award would be in honor of noted forecaster Herman Stekler who says that forecasters should predict recessions early and often and that he himself has predicted 9 of the last 5 recessions. If there was such an award, the 2015 award would go to Lakshman Achuthan of ECRI, who called for a U.S. recession in 2012 in September 2011. 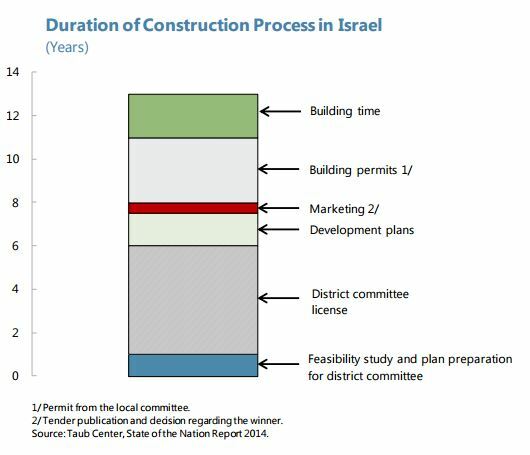 ECRI recently explained why it made the call, which is worth reading—the link is given in my presentation. In the running for the 2016 award would be Michael Shedlock (“Mish”) who at the start of this year predicted that Canada and the U.S. would slip into recession this year. “The government is continuing to implement its program to provide affordable housing. In light of the growing population and reported high house prices in the major cities, this is a considerable challenge. Estimates suggest that 160-180,000 new homes will need to be built each year over the next few years to meet growing demand. The government has allocated SR 250 billion from the budget surplus fund for the program, and the Ministry of Housing is continuing to develop options to support buyers which include the provision of interest-free loans (up to SR 500,000), and the payment of interest on behalf of the borrower for mortgage loans taken out from banks. The provision of support to buyers is being allocated according to a points system that favors those with greater need. On the supply side, options being developed include the provision of free public sector land and the proposed “white lands tax” which would increase the land available for housing”, according to the IMF’s annual report on Saudi Arabia.